"For every action, there is always an equal and opposite reaction." That quote by Sir Isaac Newton best explains the creation of the Hoka One One brand in 2009, the same year as the release of Christopher McDougall's "Born to Run." McDougall's book launched the minimalist craze and it seemed like a strange time to launch a line of running shoes that were the exact opposite. Hoka One One's could best be described as "maximalist," as they keep you as far off the ground as possible. Hoka makes a few models, most of which are for the road or the trail. The model I tested was the Bondi B, which is a road running shoe. 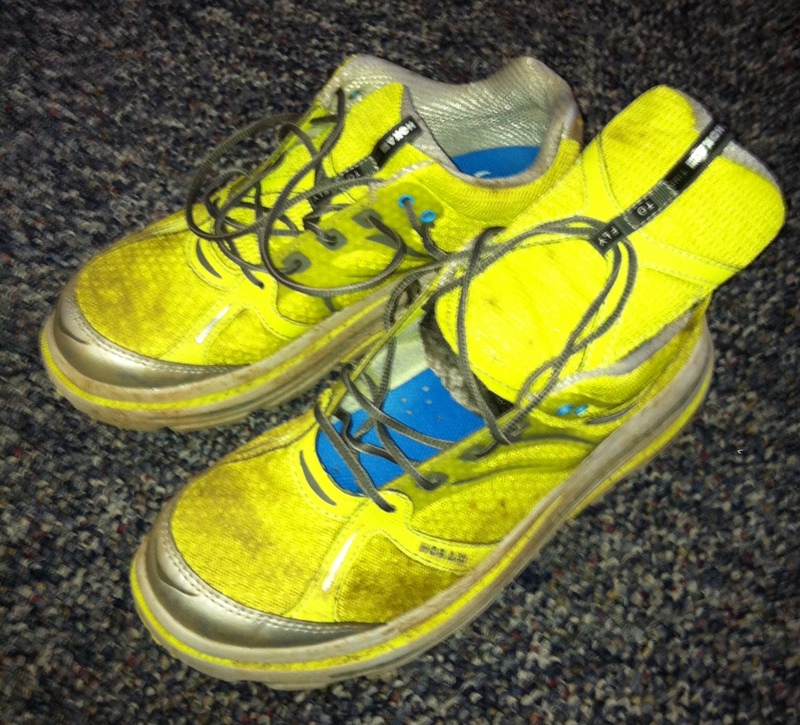 Presentation: There's no doubt that the Hoka's look different. They have the "Hubble - Zero Gravity" soles on them that are quite large, yet quite light. They say "Time to Fly" on the tongue, which is a nice touch. The laces are the strong, trail-grade laces that are on par with what most companies use these days. They also have a good amount of reflection on them, which is nice if you like to run at night (or on the side of the road). Fit: The Hoka's have a nice, wrapped fit. It's snug from all angles, likely from only having five eyelets per side. It has always confused me as to why some shoes have 8-9 eyelets. More room for error in my opinion. You do sit up, but that's the point. More on that below. Run: The run takes some getting used to and I put them to the test. I hit the roads, the trails, and even the track for a 10x400 session. 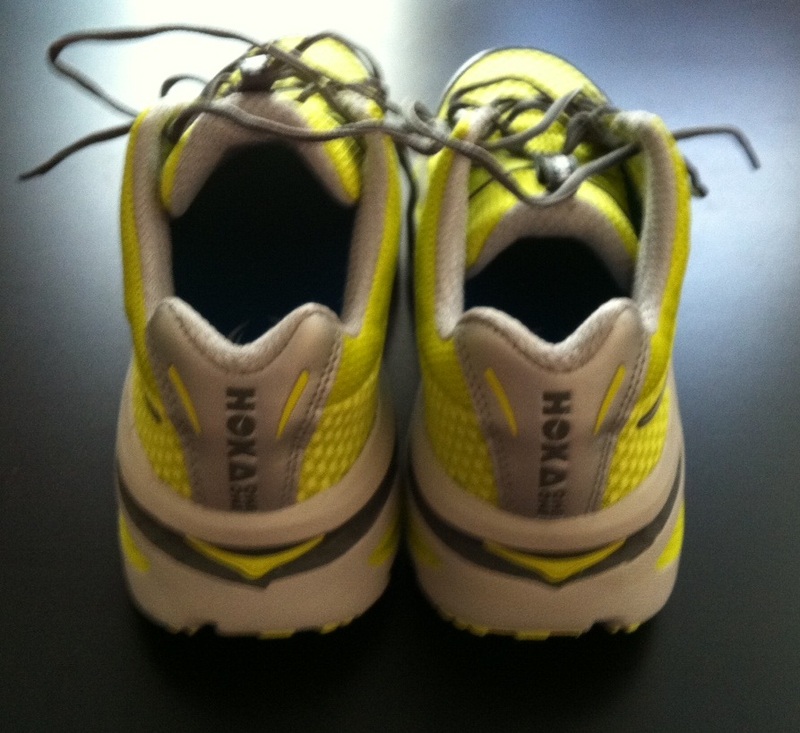 I've had lots of shin problems in the past year and can happily say that I felt the Hoka's helped alleviate that pain. The first thing you will notice when you take off for a run is that you sit up a little bit. You sink into the sole a little bit, yet it's not really super bouncy or cushy. They are surprisingly responsive for what looks like you're running in space boots. The only place where they felt a little odd was on the track. They were a little softer than usual there, but I was running on Wake Forest University's nice, soft track that is built for distance running. Final Thoughts: All in all, I enjoyed the Hoka's. It's a little bit of an acquired taste, but there's a market for it. I waited for some time to actually test their shoes, as they were sold out and on backorder nationwide. That's a good problem to have. The only issue I had with them was likely user error. If you look to the photo on the left, you can see the tongue ripped out from the bottom. I tie very tight and put pressure on the tongue. The only feedback I would have is to make a strong stitch at the bottom of the tongue to the shoe, instead of adhesive (in future models), so that this doesn't happen to others. If you have any specific questions about the Hoka's, feel free to email me directly and I'll answer anything you have! UPDATE: I superglued the tongue back on and knocked out 2 hours and 5 minutes on the single track trails of Umstead Park with no problems! 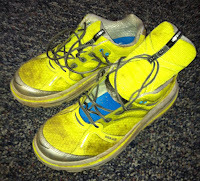 Check out the Hoka One One Bondi B's, sold directly by Hoka One One on Amazon.com. Follow Hoka One One on Twitter here. I would like to weigh in on the Bondi B. I am 58 years old and had a background of swimming all through college. For lack of a better term, it has always been my default sport. In my late 20's and 30's I took up marathon running and really enjoyed it. Eventually, injuries put me back in the pool. Every now and then I would yearn for the outdoors and pleasure of running and attempt running once again. And always I would end up injured with foot problems, shin splints or whatever. About six months ago I discovered these shoes and thought that they were just weird enough that they might work for someone like me. I am happy to report that I have slowly built up my weekly mileage to 40 per week with not even a hint of injury. I am hoping to do my first marathon in over 25 years again this fall. I am having a blast and I fully believe these shoes made this pleasure possible for me once again.